Typing faster is an educational software that teaches how to type with the keyboard faster, this software will teach you where are the keys on your keyboard and when must be pressed, the course starts with the very basics of typing and after complete each level the difficulty starts to increase. 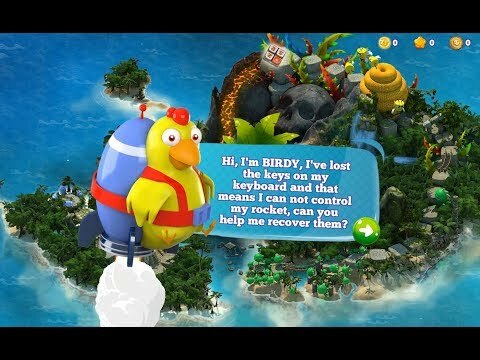 Ducky is a duck that has a hydrogen-powered rocket, flying over the Skull Island, his rocket was damaged and the command keys he uses to control the rocket were lost all over the island, we have to help him with our keyboard keys to find them. We need to search all over the island, for that we must make stops and search in each place we camp. Ducky will be guiding you through this wonderful adventure! We guarantee that you will learn how to type correctly and faster after completing all the levels of TypingFaster, see you on the island! Typing Faster was released on Linux, Mac and PC 52d ago in the US and the UK. Notify me when Typing Faster is available.